Proposed new volleyball rules and regulations: front row attack may become illegal! Can you believe that? Basic volleyball rules have changed a lot in the recent history of volleyball. The libero rule and rally scoring took place in the recent history of volleyball. Are you ready for the new changes (once again)? These changes may shock you. Front Row Attack May Become Illegal!! Proposed New Volleyball Rules and Regulations - What Exactly Is Changing? FIVB, the international governing body for volleyball have been testing new volleyball rules. What do you think about these proposed changes? Front row attack becomes illegal for the receiving team. 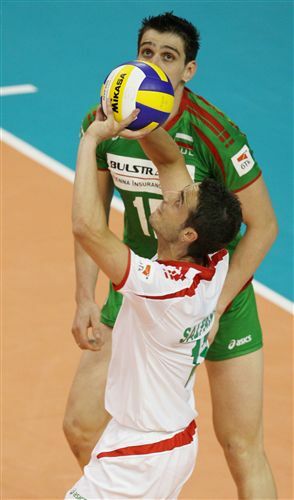 If the rules take place, it means for example the middle blocker couldn’t attack front row after the serve receive. The reason behind the proposed changes is the governing body wants to increase the length of the rallies. They want to increase the chances for the serving team to dig the ball up when receiving team attacks. Do you like or dislike, if the front row attack becomes illegal for the receiving team? How do you feel, if the changes take place also in junior volleyball? P.S. Reports claim the majority of the volleyball nations support the rules changes, but the leading nations are against it. In the beginning of 2010, it was recommended by one Committee to FIVB Executive Bureau not to support the rules changes because i.e. it is not suitable for women and junior volleyball. Which side you would take? I think that change is good for any sport to grow. However, I think that the change should be on the HEIGHT of the net. Since most players now are very tall and have amazing vertical jumps, it has become very easy to kill the ball thus shortening the duration of the rallies. Therefore, if the height of the net is increased, it would be more challenging for both the Offensive and Defensive teams to score a point resulting in longer rallies and thus consequently become more entertaining for the audience to watch. I totally agree the change is good in life. We need it in today's world where things are evolving with the speed of lighting. The majority of people naturally like to resist change. If we think about any change which takes the place in life, usually most people resist it. Generally speaking we just prefer things with the old and safe way. I am surprised that FIVB stated the most nations support the new rules. When browsing the forums, it is easy to see the majority of volleyball people are strictly against the proposed rules changes. People have been knocking the proposed rules down. I like the idea of FIVB trying to make the game for all. Their goal is to make a game for the shorter players also, not just for the big giants. Libero rule was the first step to this direction. It will encourage more people to play volleyball. I would like to see more defensive players on the court - the more we have fast and athletic players on the court, the more impressive the game becomes. I would make it happen by allowing unlimited subs or giving the opportunity to have more than one libero on the court. This would allow teams to sub the defensive players in multiple times whenever needed - and out when the offense is needed. Unlimited subs would also give teams a chance to use a shorter setter in the back row. Still this wouldn't be enough to take away the offensive superiority, which FIVB thinks is a problem since it keeps the rallies short. How could we limit the offense? Maybe moving the 10 feet line further? I wouldn't like to eliminate back row attack, because I think it is impressive to see the an athlete flying in the air when hitting back row, but I guess eliminating it would be one option too. I dunno.. but i guess, making the net lower for shorter people could be addressed at lower levels.. I feel that the "best" should be playing at the highest level. Lowering the net for me is not the answer because there are a lot of shorter guys playing basketball, football, or any other physical sport. In order to make volleyball for everyone... EXPOSURE and marketing is the best solution. Football and basketball are very well know in many countries. Leaders of FIVB should also make it that way for volleyball. Creating more leagues and TV broadcasts of games. Heck, there is even a Basketball/NBA Channel here in the Philippines. What FIVB is trying to accomplish is the longer rallies because they believe the game will be more entertaining then. And they are pretty much right, fans give most cheers and wows for the long rallies in the game. Now 80% of the rallies are finished after the first attack or serve. FIVB thinks the problem is: the offense is too superior right now - and too many mistakes on serve. Serving errors occur when teams have to take risks to break the offense. So, if they are able to make the offense after the serve receive weaker, then there will be longer rallies AND less serving errors. I am not convinced (yet) the proposed rules are the best way to make it happen, but I like what they are trying to accomplish. Join in and write your own page! It's easy to do. How? Simply click here to return to Volleyball Rules - Have a question, concern or comment about rules?.